Love is in the air, with Valentine baby names. Maybe you’re due on February 14th. Or maybe you’re just in love with the idea of a name that means something special. Either way, the hearts-and-flowers holiday can inspire lots of great baby name choices. From affectionate word names to historical and literary characters associated with romance, the possibilities are endless. 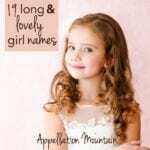 Why consider Valentine baby names? Maybe you’re seeking a sparky middle to go with a more traditional first. Or maybe your shortlist feels uninspired, and you’re looking for something fresh and unexpected. 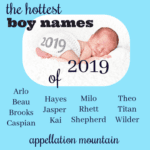 This list of lists rounds up some of the best Valentine baby names you can find anywhere, from plenty of baby name sites – including Appellation Mountain! Word names continue to gain in use, with choices like River and Aria heard on every playground in the US right about now. This list from Sophie includes some gems, like the French Bisou and literary Sonnet. The Art of Naming also thought up some creative word name possibilities, like Serenade. Sure, we think of merry with Christmas and Easter eggs, but few words are as closely tied to a holiday as love and Valentine’s Day. These names range from the obvious (just Love) to the far more subtle, but all owe something to the sound of Love. 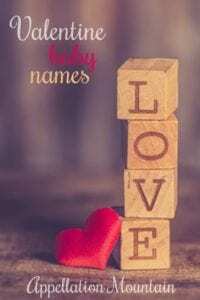 Nancy rounded up the names that include the word love, all of which appear in the US Social Security Administration data, at least in small numbers. Even Loveless! Some of these are clearly nods to the emotion, like Milove. Others, like Lovett, contain the word coincidentally. Baby Name Wizard looks at names with a strong L or V sound – or both! Think Alva and Olive. The obvious first stop for Valentine baby names: names that mean love. Some of these meanings have me arching an eyebrow, but the names are appealing. I’m not so sure about some of these meanings, but I love that this list focuses on boys. Also, Davion seems like an appealing update to David. The same cautions about meaning apply here, but there are some intriguing possibiilties on this list. Okay, there’s one name on this list that I don’t think anyone should ever seriously consider for a child. But I’m intrigued by a few other suggestions. 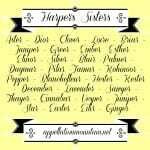 These names, on the other hand, definitely mean love – and a few don’t appear on any other lists! If you love all things sweet and sugary, this list of names inspired by candy might sound like Valentine’s Day to you. I’m still crushing on Calisson. A mix of flowers, symbols, and literary terms make up this unusual list. I’ve never even thought of Bower before, but oh, it works! So many names, all from the Latin root amare – to love. Romantic heroes – even tragic ones, like Juliet and her Romeo, often have some seriously steal-able names. These lists round up some of the best. Tulip by Any Name mixes the modern (Clark Kent & Lois Lane) with the tried and true (Cleopatra & Marc Antony) in her round-up. For a deeper dive into history and literature, check out this list from The Beauty of Names. And some more unexpected choices in this Nameberry slideshow, as well as some choices just for boys, from a mix of sources. All about Valentine. And Chaucer! Where exactly did Cupid come from? The arrow-shooting cherub is straight out of myth. He’s not alone, either. Plenty of possible names were inspired by legend, lore, and yes, love. Sophie turns to mythology for assemble a list of gods and goddesses associated with love. How, exactly did Valentine’s Day get its start? Cleveland Kent Evans dives into the question for the American Name Society. 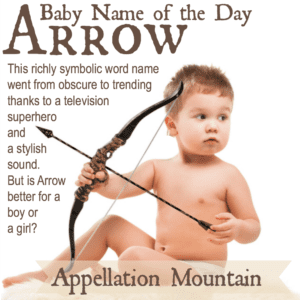 Back to Cupid for a minute: could Arrow be the ultimate cool-modern-word name that also belongs with Valentine baby names? Step into the wayback machine for medieval names that mean love, or cross the ocean for a look at the Dutch perspective on the question. The Dictionary of Medieval Names from European Sources looks at medieval name elements that mean love. And now, to the Netherlands, where names like Liebchen and Truelove are in use. Onomastics Outside the Box scoured the globe for this delightfully international list. 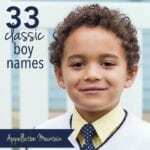 So many of the Baby Name of the Day posts have focused on great names with special meanings. Valentina relates to the saint, but also brings to mind the original meaning of the name: healthy and strong. Amoret is a rarity that might wear well today, and comes straight from the Latin amor, via Edmund Spenser. 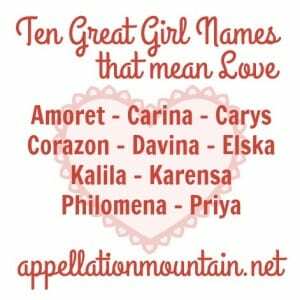 I’m always surprised we don’t hear more about Carys, a Welsh name meaning love. 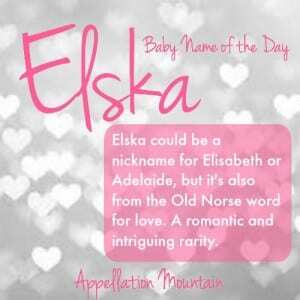 Elska comes from Old Norse, and while it sounds quite a bit like Frozen’s Elsa, it has a great meaning – and an intriguing sound, too. On the boys’ side, there’s Caradoc, a cousin to Carys. And then there’s always David, a traditional name with history galore and the meaning beloved. Looking for an even less expected, but still seasonal take on February 14th? Bewitching Names pulls ideas from the ancient Roman festival of Lupercalia. Lots of wolf-related names in this list. Brit + Co. compiled a list of general February-themed names – a little bit Valentine, a little bit not. And so tell us – would you consider Valentine baby names for your February baby? Which ones do you like best? Are there any other lists to add to this list? Please share! Originally published on February 2, 2018, this post was revised and re-shared on February 9, 2019. You’ve outdone yourself this year. 🙂 Thanks for the excellent list of lists!